This is the earliest known footage of boy wonder guitarist and VSL co-founder Mr Alan Leightell playing his Triumph guitar. During this piece his fingers can just be seen jumping up and down like maggots on the sunday joint and his wrists never leave his arms. As a result of recent correspondence on our guest book I have been contacted by the proprietors of the Bell Accordion Co. They would like Mr Leightell to contact them urgently in connection with an outstanding account for a triumph guitar. Ah Well - some you win son. Yes I am afraid it is true - due to some pretty devastating news which has emerged since the last club night . As some of you may know Alan Leightell has suffered from Tinnitus and associated hearing problems for several years. Sadly, it has recently reached the point where significant permanent damage is being done by repeated and prolonged exposure to loud music. This has brought Alan, very reluctantly, to the decision that it would be very unwise to continue to perform, either as a solo artist, or as a backing musician. Obviously, we are all gutted by this and the effect on VSL is catastrophic. For the last three years Alan has prepared, orchestrated and performed on the vast majority of arrangements for live performances for both the club nights and the various charity Gigs we have done. Taking all of these points into consideration, Alan and I have decided that the Vintage Sixties Live Club Nights should be discontinued. VSL was begun by Alan L and myself very much as a joint venture and I feel that any success we have achieved has been due to the excellent working and personal relationship we have always enjoyed and the special skills and interests each of us have brought to the project, so it seems fitting, now that Alan L is unable to continue, that we ride off into the sunset together. As far as the website is concerned we intend to continue to maintain it as a permanent record of the last three years and as an archive for all the group pictures and information kindly donated. Well, the message we are receiving loud and clear, from performers and audience alike, is that everyone would like the live entertainment nights to continue and – and whilst we will no longer be running the show – we are both happy to help in any way we can to make this possible. One of my lasting and treasured memories of Vintage Sixties Live will always be of the old friendships revived and the new friendships made. We have been staggered by the professionallism, and sheer depth of talent, of the performers who have passed through our doors over the last three years. 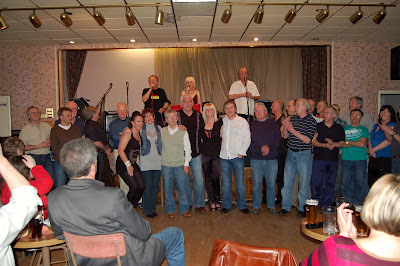 Between them they have performed well over a thousand of the songs and instrumentals from the fabulous Sixties - with little or no rehearsal - to a standard which has amazed and enthralled our packed audiences and has become the talk of Clubland and beyond. It would clearly be wrong to allow a pool of talent and enthusiasm such as this to go to waste. Everyone, without exception, has agreed to muck in and help so – with the continued support of your good selves – the Club Nights will continue under new management and with a new name – 60’s Live at the Vic. "B there or B square"